Mila Sherab Gyaltsen, Milarepa's father, married Nyangtsa Kargyen when he was 21. The couple lived happily and prosperously in the village of Kya Ngatsa (also known as Tsa). Then some relatives of Mila's grandfather - an uncle named Yungdrup Gyaltsen and an aunt named Khyung Tsha Pedon - moved to the area.By then, Mila's family had been settled there a long time and had an impressive house, considerable land and a thriving business in trade. According to the custom, Milarepa's family helped their newly-arrived relatives to establish a business, to find land and to build a house, and so things went well for these relatives as well. 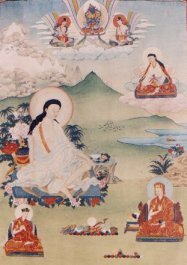 While Nyangtsha Kargyen was pregnant with Milarepa, her husband went away on a long trading tour, and during his absence the child was born. A messenger was sent to find the father and inform him that he had a new son, asked him to give a name and to return for a festival. (It is considered auspicious to have a special festival to celebrate the birth of a child.) The father replied: "This is truly wonderful. Within each generation of our family, there is only one son born. I am delighted to hear that this son has been born, and I will call him Töpa Ga." "Töpa" means to hear, and "ga" means happy or joyous, so his name meant "Milarepa, a Joy to Hear" or "Milarepa Good News." This name actually accords very well with Milarepa's attributes, since later as a great practitioner he sang wonderful songs, and when people heard them their minds were filled with delight. After a while, the father returned home and gave a big celebration in honour of their son. A few years after Milarepa's birth, a daughter was born into the family and she was called Peta Gonkyi. When Milarepa was seven years old, his father, Sherab Gyaltsen, became very sick. Realizing that he was not going to recover from his illness, he called together all the relatives for a meeting, including Yungdrung Gyaltsen and Khyung Tsha, the uncle and aunt. The father told them: "I am giving you the responsibility of my lands and all my goods, the house and so forth, because I realize that I will not get over this illness. You must take care of everything until my two children come of age. Please see to it that no harm comes to them, protect them from difficulties, and help them in whatever way you can. He also said that Zessay, a young woman from the village, had been promised Milarepa as his future wife through arrangements made with her parents. When Milarepa was of age, he was to be married to her, and all the property was to be given over to them. A letter was written as a testament, and signed and sealed. The aunt and uncle agreed to carry out these wishes, and having settled his affairs, Sherab Gyaltsen died. Afterwards, the aunt and uncle took the money and the land, everything entrusted to them, and used it for their own benefit. Milarepa, his sister Peta, and his mother were forced to work as servants for the aunt and uncle. They were given clothing and food that was of lower quality than the other servants, and burdened with a tremendous amount of work. The aunt and uncle made it extremely difficult for them. The mother, however, had managed to find a little bit of funds, and when Milarepa was fifteen years old, she bought a lot of beer, and invited the people from the village, including the aunt and the uncle. She said to them, "Thopa Ga, Good News, is now 15 years old, and it is time for him to get married to Zessay, his fiance, and to begin his own life. Now please give us back what has been entrusted to you for all these years." The aunt and uncle replied, "We don't have anything to give you. We have been taking care of you for so long that you have used up all your resources. There is nothing here for you, not even a needle or a thread left to give you." They spoke at length like this, denying that there was anything left. In addition, they beat Milarepa's mother. The parents of Milarepa's fiance, Zessay, were kind to him, giving him new boots and clothing. They comforted him, saying, "Wealth is nothing permanent, but something that is made by people through their work. In the beginning your ancestors had no money, but they made it through working. For lack of money, don't be disappointed or discouraged. You must study and develop capabilities, and while you are doing this, whatever you need we will provide for you." In this way, they inspired and comforted him. Milarepa's teacher from the village, as was often the case, was also the local priest, and he went around to the different houses performing religious ceremonies and so forth. Milarepa accompanied him as an attendant, and on these rounds, they were often given food and drink. One day when Milarepa was returning home earlier than his teacher, his mother was on the roof of the house and saw him coming. Milarepa was a little bit tipsy and singing a song. When his mother saw this, she became outraged and yelling at him in a loud voice, came tearing down the steps of the roof with a stick in her hand. This stick was one used to push a stone mill to grind barley for tsampa, so it was quite a powerful one. She came after him with this stick, crying: "Mila, you are a child with no father, and you are going around with your belly full of food and singing away drunk. Your sister and I are here in great suffering. What are you doing? Your mind has become totally deluded. Your aunt and uncle have taken all of our cattle and our money, and here you are just wandering around drunk. We had great hopes that you would study and at least learn how to earn some money and develop good qualities, yet here you are wandering around in the gutter." Milarepa then wept and said: "You are right. I have been behaving terribly, and whatever you say I will be glad to do. I had a little bit to drink at the house of a patron, but the song that I sang arose out of sadness. In the future I won't drink. Please be patient with me." Milarepa and his mother stood there crying, and his sister Peta joined them. While Milarepa was studying, Zessay provided him with what he needed, but the mother now said: "I will take a job in another house, and I will work to get money for your clothes, your boots, and food. I will provide you with what you need. In our family there is a lineage of men who have been powerful in the use of mantra, and so I want you to go to a capable and skilled lama from whom you will learn how to perform various kinds of magic. Do this until you can create various signs that everyone can see. It must be obvious that you have these powers. If you can't do this I will jump off the roof of the house and kill myself. If you can do it, I will offer wonderful prayers for you. Milarepa's mother sent him on his way, and he arrived in Utsang, the central part of Tibet, where he met Yungton Trogyel of Kyorpo. From him Milarepa learned black magic and also how to send hailstorms. Back in his village of Tsa, the aunt and uncle's son had come of age, and in their house they were giving a large party for him to which many relatives had been invited. Through his black magic, Milarepa was able to make the house collapse and thirty-five people were killed. Through his other magical powers, he was able to send hail on the village and that destroyed the harvest. His mother was filled with happiness. She took all the red cloths she had, tied them to the end of a stick, and, waving it like a victory banner at the top of the house, she communicated in a loud voice to the whole village the following message: "The son that was born to Sherab Gyaltsen and myself has come of age and has been helpful to us. He has given an answer to our enemies and conquered them. My mind is finally satisfied. I am happy. Now if there are others in this village who wish to harm us, please come forth." With such proclamations, she went around the village.